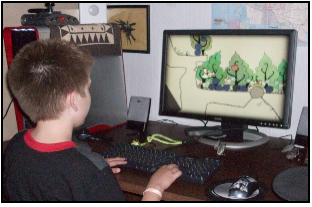 A good computer game with educational value must also score high in the artistic and creative categories. Before recommending such games to any of my grandkids, I play through each game. 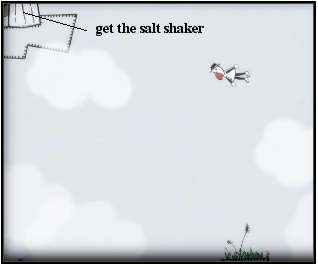 That's not a chore for me as I love interactive games, enjoy a good story told with imagination and verve, and appreciate colorful graphics done with a unique and creative style. Such is Blueberry Garden, a simple ecosystem with you as its caretaker. Your job, take care of it. Long before the James Cameron's movie, gamers coined the name "avatar" for the character you control in an interactive computer game. 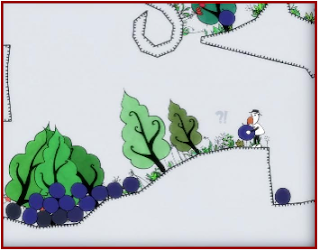 Your avatar in Blueberry Garden is a birdman. Birdman can walk, jump, eat, and most importantly, fly! After playing for twenty to thirty minutes you discover that Blueberry Garden is filling with water. Your first major challenge is to find the source of the water and turn it off. You roam the garden collecting various items that you stack on a platform above the only door in the garden. Enter the door and you are transported to the top of the stack from where you can access and explore the upper levels of the garden. A variety of fruit can be found in the garden. Eating each type of fruit increases your powers in a different way. For example, eat a blueberry and fly higher. 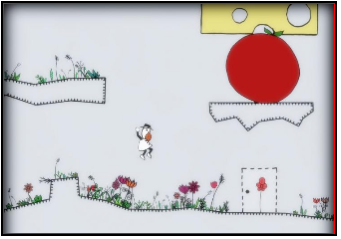 Blueberry Garden is designed to be finished in one sitting so there is not a Save Game option. There are several plateaus in the learning curve so as you build your knowledge of the game you can quickly play through the lower levels to get back to the point where you attempting to solve the next problem. In this picture, Joshua is trying to remove the gray-colored rock to gain access to the chamber below the rock. Here, Jordan has found a black camera to add to the stack. Now, how to get it? Curiosity, a willingness to explore, and perseverance are all problem-solving attributes that can be exercised independently from the constraints of school curriculum. That's one reason my grandkids didn't have to be forced to play Blueberry Garden. Kids are naturally curious, love to explore, and will persevere in the right context. As far as I know, Blueberry Garden can only be purchased online from STEAM (www.steampowered.com) and is a real bargain at five dollars. You can also download a free demo of Blueberry Garden and give it a test drive before you buy. Readers know that I am a big fan of STEAM. The client software is a free download and you can access your account and play games from any computer. I played games on STEAM during a recent trip to Belgium. Grandmothermath and I have established STEAM accounts for each set of grandkids. Doing so allows us to purchase games and add them directly to each account. 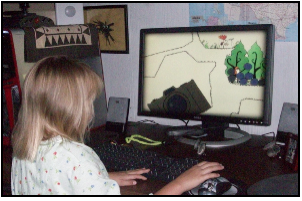 We share the username and password for each account with mom and dad so they can also add games to the kid's accounts.